As the fall season begins and the weather starts to change, it is the ideal time to take a closer look at your skin. As women, we are encouraged to care for our internal organs with yearly tests, but we often neglect to take equal care of our skin. In fact, there are just a few easy guidelines you can follow to ensure that the largest organ of your body stays healthy. Prevention in skin care is crucial: You can avoid so many problems by being proactive with your skin care, particularly by using sunscreen. Even though we know a lot about the damage that can be done by sun exposure, there are still many misconceptions about SPFs. If you’re going to get incidental sun on a daily basis, the American Academy of Dermatology recommends using a facial sunscreen or moisturizer with an SPF of at least 30. However, SPFs higher than 50 offer a minimal increase in additional protection. Instead, it’s how you apply it that counts. You need to use at least a shot glass amount of sunscreen for the whole body, and reapply it every two hours when you are outside, year round. And remember, caring for your skin is really a head-to-toe job, from your scalp and ears to the tops of your feet. Choose tried and true products from brands that you trust: Speak to a board-certified dermatologist about what products they recommend. You can find very nice products at your local pharmacy; just remember to look for hypo-allergenic products that are noncomedogenic to avoid clogging or irritating the skin. Remember the ABCDEs of skin cancer prevention: Having a yearly body check of your skin from head to toe is so important, and the most crucial thing you can do to diagnose melanoma in its early stage, when it is entirely curable. It all starts with checking your moles for irregularities. “A” stands for asymmetry”any irregularity where the mole is different from side to side could be a potential warning sign. “B” is for border. A jagged edge on a mole could also be a sign of melanoma. “C” is for color, which should be uniform and even, whether it is light or dark brown. If the color is variegated, jet black in color, or mottled with whitish, reddish or bluish hues, this could be trouble. “D” is for diameter. Usually, a benign mole is no larger than a pencil eraser. “E” stands for evolving. If you find a mole that seems to be growing”especially if you’re over 40”you should check it out immediately. Sometimes out of nowhere you’ll find a pink bump without pigment you haven’t noticed before. There are so many benign things it could be, but it could also be a very rare type of melanoma called an amelanocytic melanoma. So if it’s new and evolving, get it checked out. I like to tell patients about the “ugly duckling” sign. If you look at all your moles and one is a bit “funky” or stands out from the others, this could mean a potential problem. That’s reason enough to get a body scan by a board-certified dermatologist. I urge you to log onto to take the Skin First Pledge. When you put the health of your skin first at every age, looking beautiful and feeling confident will surely follow. Dampen your hands and face with lukewarm water. Avoid hot or cold water, which can aggravate skin problems such as redness and rosacea. Squeeze a dime-sized amount of Liquid Facial Soap in the palm of your dampened hands, or create a lather with the Facial Soap using your palms and lukewarm water. Smooth the cleansing product over your face for 15 seconds. Using circular motions, gently massage the soap into your skin with your fingertips or a dampened washcloth. Limit your face-washing to less than 60 seconds to avoid stripping your skin of its natural oils. Splash your face with warm water four or five times to rinse your skin and completely remove the product from your face. Rinse and dry your skin with a clean paper towel or a clean washcloth. Choose the Mild Clarifying Lotion or the Clarifying Lotion number that corresponds with your skin type, then dampen a cotton ball with the solution. Wipe the cotton ball around your face for 60 seconds to remove excess oil and dead skin. Gently rub the cotton ball on your face and neck, using small upward strokes. Let the product dry. Place a dime-sized dollop of Dramatically Different Moisturizing Lotion+ or Dramatically Different Moisturizing Gel into your hand. Smooth the product onto your face and neck to seal in moisture. Dampen your hands and face with lukewarm water. Squeeze a dime-sized amount of the men’s liquid Face Wash, or create a lather with the Face Soap and water in the palms of your hands. Smooth the product over your chin, nose, cheeks and forehead. Let the product remain on your face for 15 seconds to remove oil and dirt, and soften your facial hair. Rinse your face with three to four splashes of lukewarm water to remove the cleanser, then towel dry with a washcloth or paper towel. Dampen one cotton ball with the Clinique for Men Exfoliating Tonic or Oil Control Exfoliating Tonic. Apply the product to your neck and face for 60 seconds to prep and exfoliate your skin for shaving. Smooth the product on your skin using small upward strokes. Let the product dry. Place a dime-sized amount of New Clinique for Men Moisturizing Lotion or Oil Control Mattifying Lotion into your hand. Use the mattifying lotion for any skin type. 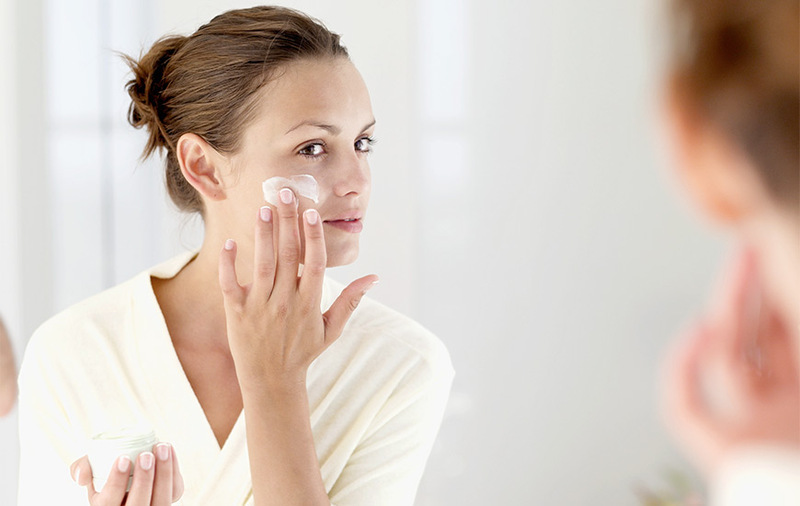 Use the moisturizing lotion if you have very dry, dry or dry combination skin. Smooth the product onto your face and neck to seal in moisture. Choose a facial soap based on your skin type. The Clinique soap formulas for women are designed for very dry to dry skin, dry combination skin, or combination oily or oily skin. The men’s cleansing products are divided into “all skin types,” dry and oily skin formulations. Use the Clinique moisturizing lotion if you have dry skin and the gel formulation if you have oily skin. The Clinique men’s Exfoliating Tonic is sold in oily and dry skin formulations. The Men’s oil control exfoliating tonic, however, is for oily skin types only. Follow the Clinique three-step system in the morning and right before bedtime.